LONDON, PARIS June 20, 2016 – Academy Award®-winner Ron Howard’s authorized and highly anticipated documentary feature film about The Beatles’ phenomenal early career The Beatles: Eight Days A Week – The Touring Years has set its World Premiere Date in London’s Leicester Square 15 September 2016 and debuts the first trailer from the film and the official poster to launch the campaign, it was announced today by Imagine Entertainment, White Horse Pictures and Apple Corps Ltd. STUDIOCANAL is an anchor partner on the film having acquired UK, France, Germany and Australia and New Zealand rights. Richard Abramowitz’s Abramorama will handle the US theatrical release of the film on September 16. The US release is set to be an event driven experience with a few special surprises planned for cinema goers. The Beatles: Eight Days A Week – The Touring Years is based on the first part of The Beatles’ career (1962-1966) – the period in which they toured and captured the world’s acclaim. Ron Howard’s film will explore how John Lennon, Paul McCartney, George Harrison and Ringo Starr came together to become this extraordinary phenomenon, “The Beatles.” It will explore their inner workings – how they made decisions, created their music and built their collective career together – all the while, exploring The Beatles’ extraordinary and unique musical gifts and their remarkable, complementary personalities. The film will focus on the time period from the early Beatles’ journey in the days of The Cavern Club in Liverpool to their last concert at Candlestick Park in San Francisco in 1966. Hulu is championing the film in the US as presenting partner. Hulu has the exclusive US streaming video on-demand rights to the film on SVOD beginning September 17th – marking the first feature film to debut on Hulu following its theatrical premiere. 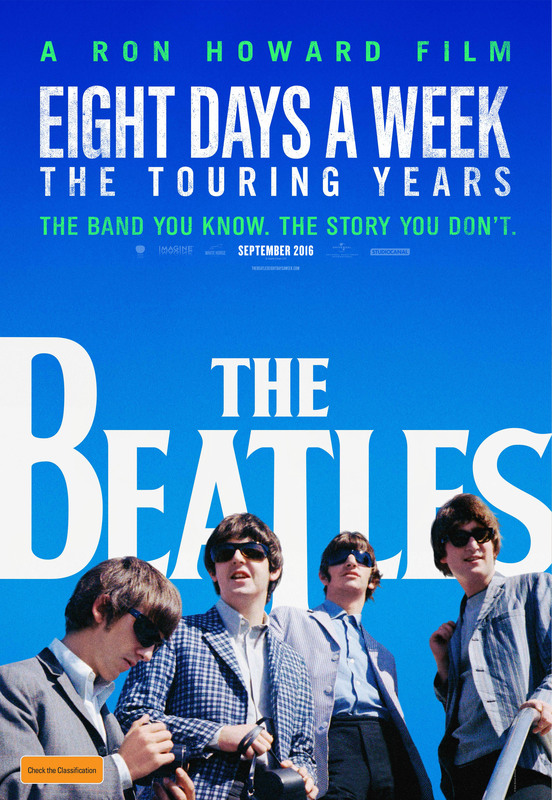 The Beatles: Eight Days A Week – The Touring Years is the first film acquired by Hulu’s Documentary Films arm which will serve as a new home for premium original and exclusive documentary film titles coming to Hulu. Award-winning Editor Paul Crowder is the editor. Crowder’s long-time collaborator, Mark Monroe, is serving as writer. Marc Ambrose is the supervising producer. This project was originally brought to Apple Corps by One Voice One World, which has conducted extensive research around the globe, including inviting Beatles fans to send in clips of home movies and photos that they acquired during this extraordinary period. OVOW’s Matthew White, Stuart Samuels, and Bruce Higham are co-producing the film. Nicholas Ferrall is the executive in charge of production for White Horse Pictures, assisted by executives Jeanne Elfant Festa and Cassidy Hartmann. The Beatles documentary is one of the first projects under Nigel Sinclair’s new White Horse Pictures banner, which he founded in 2014 with long-time business partner Guy East. Their recent documentary, David Gelb’s A Faster Horse, had its world premiere at the Tribeca Film Festival where it received rave reviews. The Beatles began touring Europe in late 1963, after an extraordinary arrival on the British scene in 1961 and ‘62. However, it was their much-heralded Ed Sullivan appearance on February 9, 1964 that caused The Beatles’ popularity to explode. By June, the band had commenced their first world tour, and continued on a relentless schedule for two subsequent years. By the time the band stopped touring in August of 1966, they had performed 166 concerts in 15 countries and 90 cities around the world. The cultural phenomenon their touring helped create, known as “Beatlemania,” was something the world had never seen before and laid the foundation for the globalization of culture. This entry was posted in Apple, Beatles, Beatles Music and tagged Apple Records, Beatles, Beatles Film, Eight Days A Week, Ron Howard by beatlesblogger. Bookmark the permalink.